Gov. Ralph Northam recently did something startling. He affirmed what many critics of Virginia Beach City Hall have been saying for years: The Resort City is rife with favoritism. Whoa. Who saw that coming? Northam’s right. The city is crawling with cronyism. Over the past six months I’ve reviewed thousands of documents connected to the new Virginia Beach Pier project, the Arena, the Dome site, the Cavalier Hotel and many other public-private partnerships. The records refreshed my memory. They’ve also provided a bit of déjà vu as I watch Bruce Thompson and his partners try to beat out other developers to win the right to build a new pier with millions of taxpayer dollars. As the city decides who will build an elaborate pier complex – and gain millions of dollars in public support – some officials are already rallying behind the efforts of developer Bruce Thompson. 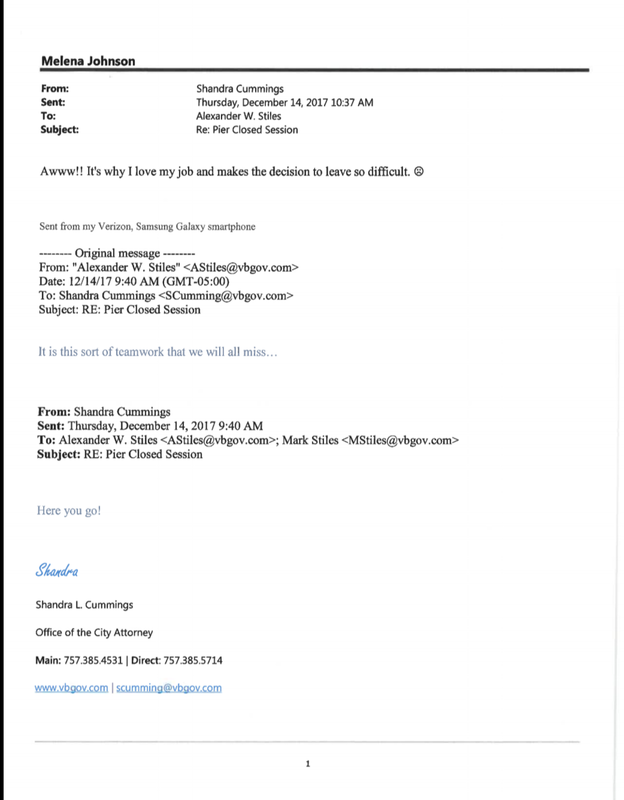 Former VBDA member Linwood Branch sent a letter to a Virginian-Pilot columnist seeming to support Thompson’s plan before there was even a formal call for bids. City Councilman John Uhrin asked for a new conflict opinion to see if he could vote on Thompson’s bid, even though his wife works as lead salesperson for parts of another Thompson-led project. 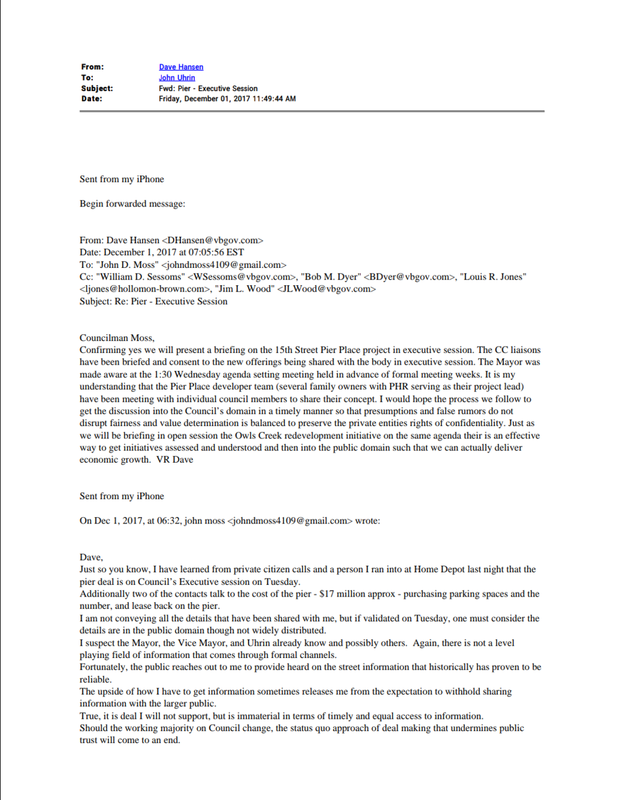 And City Manager Dave Hansen has fed information to Thompson, including an email sent to Hansen by a city councilman concerned by the project. Earlier this year the city manager’s office, the City Council and the Virginia Beach Development Authority attempted to award a lucrative contract to build the pier to a team led by Thompson, giving other developers just about two weeks to present alternative plans. After City Auditor Lyndon Remias stepped in and said the process needed to be more transparent, the council reopened the bidding. New plans were submitted and everything is on hold until after the November elections for City Council and mayor. But the apparent attempt to fast-track a lucrative project spearheaded by the council’s favorite developer raises this question: Will the curious behavior by those in City Hall to help Bruce Thompson land the Cavalier deal be a blueprint for the way they handle the pier project? Some of the information below was reported by me in the Pilot in November, 2015, in a story that ran a few weeks after I quit the paper. More of it is new and has never been reported. All of it, however, is illustrative of the cronyism that many - including the governor - believe is rampant in Virginia Beach. Almost from the time developer Bruce Thompson first won the right to buy and renovate the historic Cavalier Hotel in June of 2013 some city officials and Thompson supporters were insisting that Virginia Beach operates on a level playing field. Now, after reviewing thousands of pages of Cavalier-related records through a Freedom of Information request - the same documents subpoenaed by a federal grand jury - one thing is clear. Claims by current and former city officials that they didn’t help Thompson’s team get an inside track on the Cavalier are fiction. In fact, city staff were assigned to deal exclusively with Cavalier, LLC members and provided the company with detailed financial information and promises while refusing to provide hard numbers to his competitors. The records also show that the city had presented its entire incentive package to the Cavalier team at least two months before the first public meeting, which took place on June 11, 2013. 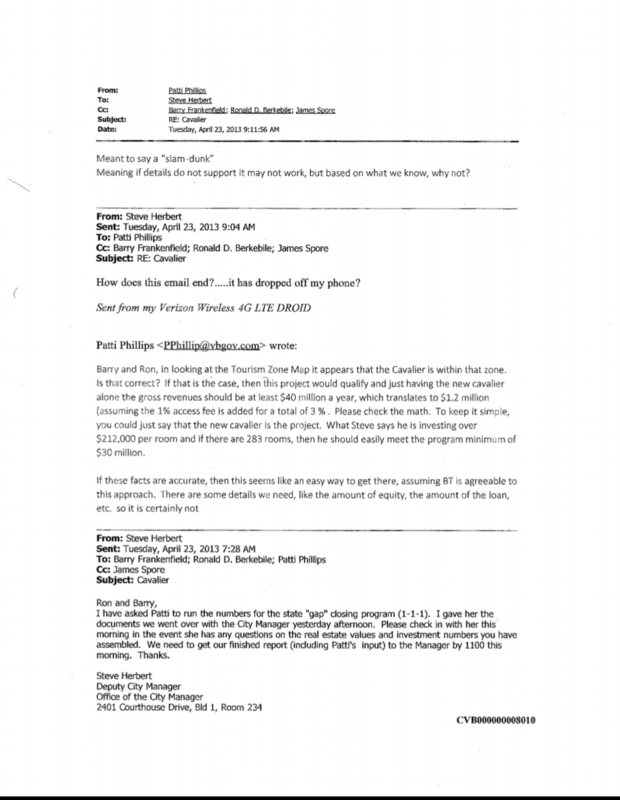 Virginia Beach Finance Director Patti Phillips suggested using tourism tax revenues for Thompson, “assuming BT is agreeable with that approach,” according to an email she sent to then-City Manager Jim Spore and others on April 23, 2013. All emails were obtained through the Freedom of Information Act. That contradicts claims made by former Mayor Will Sessoms that negotiations with Thompson began only after the local developer won the bid. Records show that the city was so eager to help Thompson that staff designed a no-bid contract for $2.5 million for him to build the 925-foot Cavalier Drive based on an estimate that city engineers said was so inflated it should never be used. One engineer wrote that the estimate was only “conceptual” and based on no actual design. “If we add a lane or go with gold leaf pavers, we’ve got it covered,” Dan F. Adams, a city engineer wrote on June 26, 2013, one week before the City Council voted to give Cavalier, LLC the largest incentive package in city history. Yes, gold leaf pavers. Your tax dollars. And nobody seemed to care. With information nobody else had, Thompson easily submitted the highest bid for the parcels, lawyers involved in the sale told me years after the sale. I don’t blame Thompson. Fault lies with city staff and the obviously conflicted elected and appointed officials who give them their marching orders. On June 10, 2013 a Virginia court ordered that the old Cavalier Hotel and surrounding parcels to be sold to Thompson for $35.1 million, the high bid among at least six interested developers. The order followed a multi-year court battle that put the future of the historic hotel in jeopardy and prompted the city of Virginia Beach to take actions to save the landmark. Those actions included the creation of a Cavalier Task Force, which was directed to recommend a series of financial and zoning incentives to be shared with potential developers and Realtors. The stated goal was to attract national interest and create competition that would benefit taxpayers and provide the highest and best restoration of the property. Instead, the records make clear the efforts to steer the Cavalier to Thompson’s team started early. 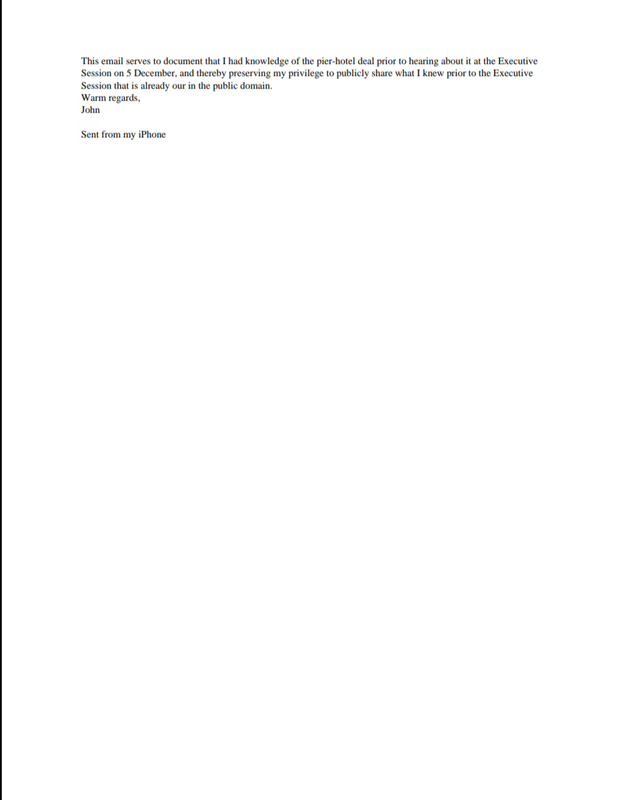 Weeks before the auction, then-City Manager Jim Spore sent letters to Doug Henkel, the Realtor handling the sale. In a March 5, 2013 letter Spore told Henkel the city could offer only vague, “potential” incentives to prospective bidders, and would negotiate with the buyer only after the Cavalier auction concluded. 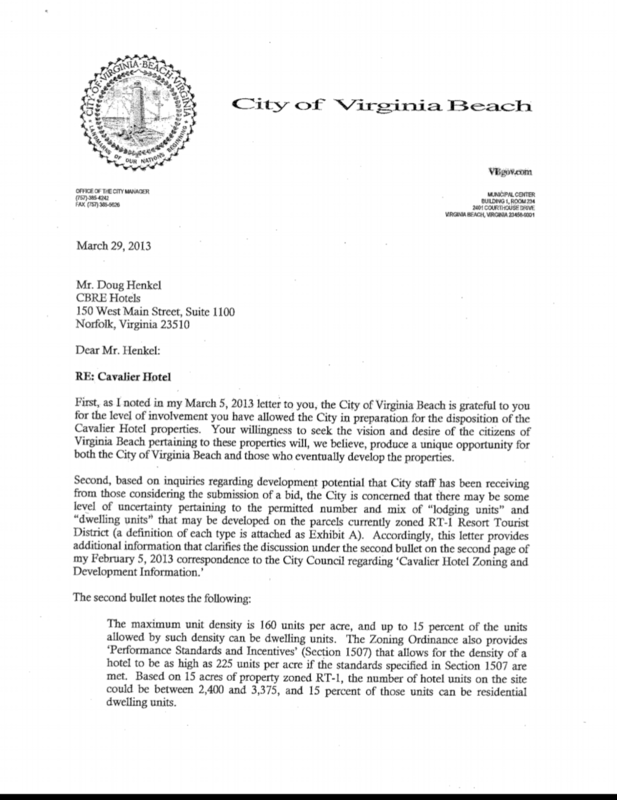 Then, in a March 29, 2013 letter, Spore informed Henkel that city zoning laws did not allow single family homes to be built on the Cavalier property. Henkel reacted angrily to Spore’s assertion, saying the homes were the only way to make restoring the historic Cavalier economically feasible. About a week later, however, Spore and city staff sent a detailed incentive package to Cavalier, LLC promising $19 million in public aid and giving him permission to build 86 single-family homes on the property. The staff also provided detailed and full financial calculations for each aspect of the city’s incentive package. In another interview with the Pilot, Spore disagreed. He said Henkel was informed that the city was willing to rezone the property. Records show that former Deputy City Manager Steve Herbert and City Planning Director Barry Frankenfield worked directly with Thompson, sometimes meeting at his Gold Key/PHR headquarters. Frankenfield developed the city’s incentive package, revised it more than a dozen times and guided Thompson through the process of applying for state tax breaks through a tourism gap financing program. 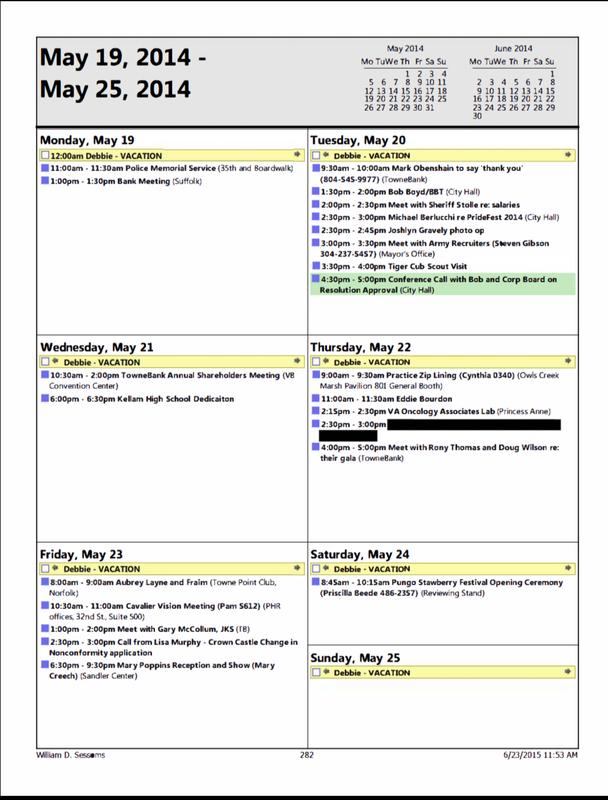 On April 25, 2013, the deadline for the court-ordered auction, Herbert, Spore and Thompson spent two hours together for a final Cavalier meeting, according to Herbert’s appointment calendar. By contrast, Herbert and Frankenfield met with a Richmond developer and an attorney involved in the sale four days earlier and emphasized that they could make no promises about incentives, both men told me in interviews. In all, Frankenfield and other city staff compiled at least seven potential incentive packages for Thompson, including one that was delivered to the Cavalier team on April 24, 2013, one day before bids were due on the court-ordered auction. 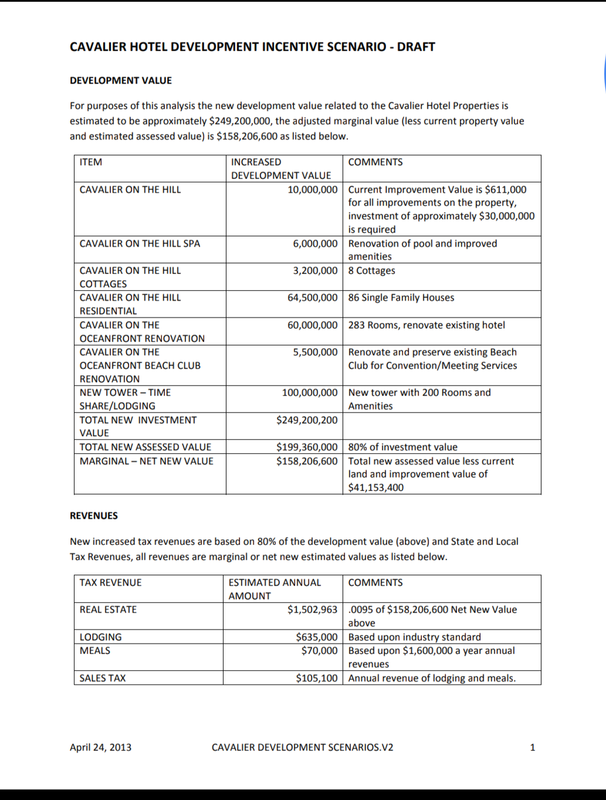 Frankenfield also devised the grant that gave Cavalier, LLC an upfront payment of $11.2 million to Thompson – the only time EDIP money has been given prior to a development even starting construction. Thompson used the incentive money to buy the Cavalier, according to land records. The records also show that the city officials bent policy, ignored their own safety codes at times and worked to “edit out,” any concerns voiced by city experts in their own reports on the Cavalier development. For example, the city manager allowed Thompson to spend taxpayer money that was supposed to be used to build Cavalier Drive - a street connecting Atlantic Avenue to Thompson’s hotel - on other parts of the project that benefited only Cavalier, LLC, despite the fact that the development agreement specified that if the cost of constructing Cavalier Drive came in below $2.5 million, all extra cash should be returned to the city. But records show Spore instead approved letting the Cavalier team spend several hundred thousands of taxpayer dollars on another part of the project that wasn’t directly related to the 925-foot road. That decision came over the objections of the city attorney’s office, which said the money could be diverted only if the City Council took a new vote. “It would require a Council action and I’m still not sure why we’d do it unless we require some ownership interest in the improvements we’d be paying for,” Assistant City Attorney Alexander Stiles wrote. Well, at least Alex Stiles was looking out for taxpayers and trying to make sure officials followed the law. Didn’t do any good, of course, as Spore ignored the legal opinion and approved the money transfer without ever seeking the Council vote. Beyond that, if $2.5 million was the lowest price to build Cavalier Drive, how could there have been all that extra money before the first shovel hit the ground? To me, that extra cash, along with Deputy City Attorney Alexander Stiles’ warning, provide the best proof that the entire Cavalier Drive aspect of the project merits scrutiny. The records also show that the efforts of Spore, Deputy City Manager Steve Herbert and Planning Director Barry Frankenfield started early and continued long after Cavalier, LLC won control of the hotel. For example, Frankenfield and others attempted to block city engineers and planning staff from voicing concerns over what they thought were unsafe or illegal practices. One city engineer wrote that a decision not to force the Cavalier to build sidewalks on a portion of the project “raised red flags,” and created potential safety hazards. A member of the planning department wrote that not requiring the Cavalier to meet minimum street size and safety standards opened the city to potential liability. In response, records show that Frankenfield ordered city planning staff to “tone down” their criticisms of Thompson’s project. Frankenfield also said critical comments from public works officials should be “edited out” of official staff recommendations. Tone down criticism. Edit out official comments of your own paid safety and compliance engineers. Is this what you expect of your city employees? Will this happen again, this time with the pier project? Herculean efforts to help Thompson didn’t end with city staff. Former Mayor Will Sessoms was forced to abstain from voting on the Cavalier project because he served as a president of TowneBank, which financed the project. City Councilman John Uhrin also had to abstain because his wife served as lead salesperson for the private homes that were the key to making the entire project viable. Still, calendars for Sessoms and Uhrin - obtained through a FOIA request - showed that the men got creative. 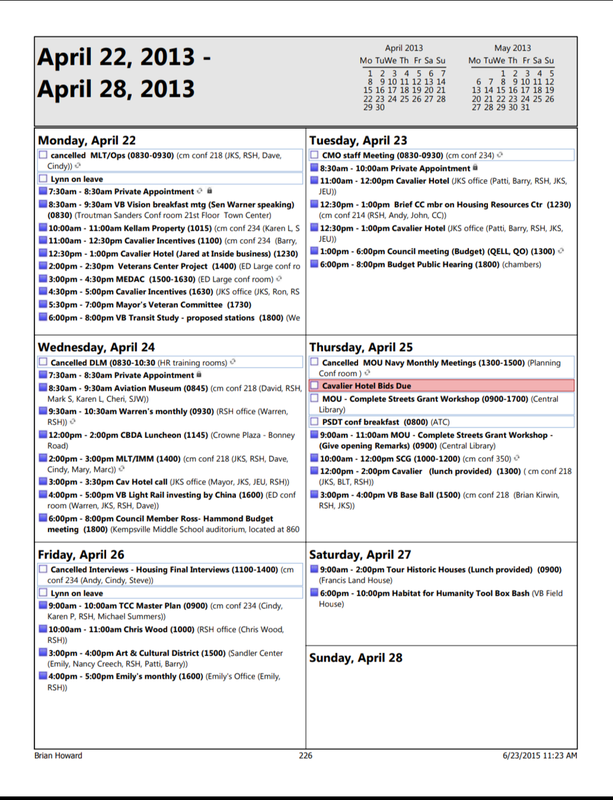 For instance, on October 11, 2013 - three months after Sessoms announced he had a conflict and couldn’t take part in Cavalier discussions - Sessoms, Uhrin, Bruce Thompson, Spore, Herbert and others scheduled a Cavalier zoning meeting at Thompson’s Gold Key headquarters, according to appointment calendars of all involved obtained through FOIA. Uhrin had not yet announced his conflict, although his wife had started working as salesperson for the Cavalier homes, her boss Bart Frye, told me when I first wrote about the Cavalier conflicts. 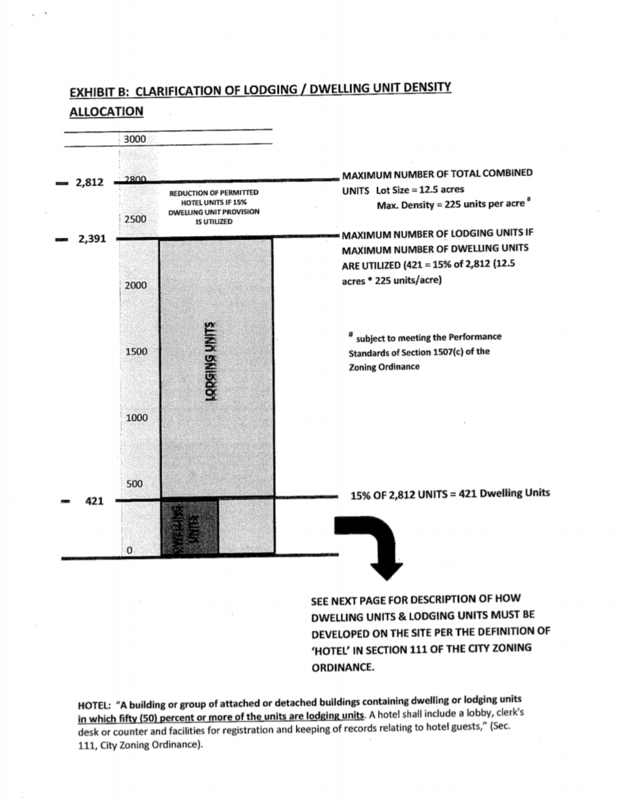 Then, on May 23, 2014, Sessoms, Uhrin and Spore scheduled a second meeting at Gold Key, this time to discuss “a Cavalier Property Vision Plan.” By this time Uhrin had declared he had a conflict because his wife was leading the sales team selling nearly $80 million worth of private houses on the Cavalier grounds. The pier project is beginning to feel a lot like Cavalier Part II.